As an advocate, trainer and coach of LinkedIn, I write a lot of articles and facilitate numerous workshops on how to leverage the power of LinkedIn to get hired by the right company or clients. There are so many fantastic integrated elements to writing a profile that works for you. This article is all about the space. There is a blessing and a curse to the character limits to LinkedIn: it allows a cut off for those who have a tendency to ramble on and on and on and on while reducing the stress of those who are not comfortable talking to a great extent about themselves. Here is a breakdown of the character limits for personal profiles. I am also attaching a list of special characters that you can use in your profile (heading, summary, title etc) that can be copied and pasted directly from this article. For the visually driven, here is a link to a profile with highlighted blurbs giving each element’s character maximum: LinkedIn Personal Profile Character Limits. All of the character limits listed are maximum unless indicated otherwise. 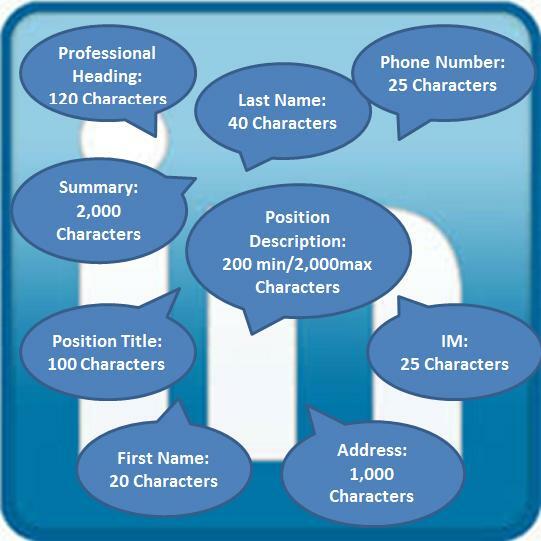 In LinkedIn, everything counts as a character – spaces, punctuation, returns etc. To easily determine your character count, at the end of this article, I have included instructions for a quick check in Word and two external links. First Name: 20 characters, Last Name: 40 characters. LinkedIn Status Update: 600 characters – unless you chose to update LinkedIn and your Twitter, Twitter updates are 140 characters. Please use them wisely! Remember, you can copy and paste right from this article.